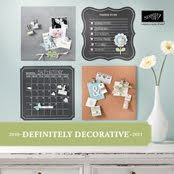 During the month of June you have the opportunity to not only get to see a new set that will be in the fall catalog but you will also get the opportunity to order it! How great is that? When you purchase the new Fresh Cut stamp set you can get the coordinating note cards for only $5 more. To see more on this promotion check out the link on the right under specials. Also during the month of June Stampin' Up has put together a bundle pack to make creating notecards even easier. 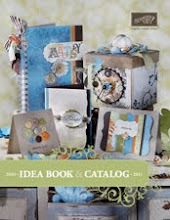 You get the circle of frienship stamp set, Rose Red classic stampin' pad, very vanilla 5/8 grossgrain ribbon, and the loves notes assortment all for $30. Thats a 25% discount! For more details check out the links on the right hand side under specials to download the flyers! My mom is coming into town this week (from Pa) and my boys havent seen her since november and I am terrible about sending pictures so I thought I would make her a little book to take home with her. Its nothing big, but quick, easy, and cute. Instead of having all the pictures cut, you can add journaling or embellishments or something, but i thought maybe she would like more pictures to show off to everyone. When its all put together (folded up) it is a 4x4 square. Then when you open it, You can see all the pictures, journaling, etc. 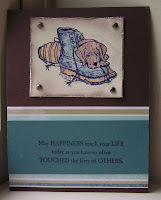 Here is one of the other cards we will be making at my class on the 30th with the for father stamp set. I wasnt real sure if I liked it after I got it all together, but it has definately grown on me. It has such a country feel and the colors are kind of uplifting. Its completely different than the other 3 cards we will be making whcih use browns as a base color. This one uses real red, river rock, western sky dsp, not quite navy, and very vanilla cardstock. I used the ticket punch on the corners and then put vintage brads on the not quite navy where the corners are missing. It was looking awefully plain so I put some bashful blue grossgrain ribbon across it which helped to break up the stripes a bit. 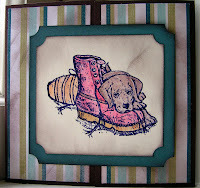 I used my stampin pastels and blender pens to color in the stamped image. I know its not such a great picture but this was a gift for my mother in law. The "flowers" are pictures of all of her grandchildren. 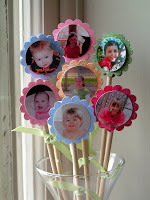 I got the vase and dowl rods at michaels and the stones at walmart. Then I simply punched out some scallops using the SU scallop punch and glued pictures in the center of them on both sides (allowing her to turn the picture around if she wanted to look at a new one). I used an industrial strength glue (E6000 i think) to glue the scallops to the dowl rods. Then I took SU's certainly celery and tied it around the rods as leafs and finished it off with chocolate chip taffeta ribbon. 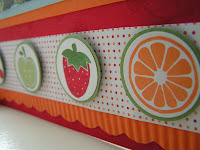 Isn't this set just perfect for a summer themed scrapbook page? I used real read, only orange, wild wasabi, and bashful blue cardstock. I added a stip of the summer picnic designer paper. I used certainly celery, only orange, garden green and real red markers and ink pades. 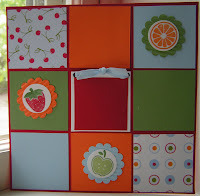 You cant tell it from the picture, but I stamped cherries on the red cardstock to make a simple background. I crimped the scalloped border to give it that extra dimension and added some eyelets and ribbon to finish it off. For this second page, its an 8x8 page with 2 1/2 by 2 1/2 squares. I crimped the scalloped circles for the added dimension again. I really love that crimper. 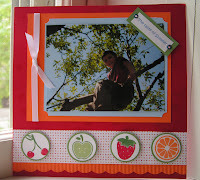 I also used the really red, only orange, wild wasabi, and bashful blue cardstocks, summer picnic designer paper, and coordinating inks on this page. I again used the eyelets in the center square. I am going to put pictures in the orange, green, and blue empty squares (havnet decided which pics yet though) and then I will add some journaling with a white journaling pen in the center. Its a very simple, versatile, cute page. So it's been awhile since Ive actually posted on here. I just knew I wouldnt be good at keeping it updated. But anways I am having a fathers day class May 30th at 6:00. It will be held at my house and the cost is $10. We will be making 4 different cards using the "for father" set and you will also get envelopes. They will be finished and ready to be sent out to your loved one. The nice thing about these cards is that they can be used for holidays other than fathers day as well. I posted two of the cards we will be making. As a thank you to everyone that places an order that night, for every $50 you purchase (before tax and shipping) I will give you a free pack of 8 1/2 by 11 paper of your choice! RSVP by May 20th to ensure a spot in the calss. If you cant make it to the class and would like to purchase the cards you can do so for an additional $5 just contact me ahead of time. Thanks!